It’s a foodie’s dream: A day all about cooking, eating and discussing food. Mark your calendar for the weekend of 1st September and head to Byron Bay for the one-day food festival, Sample Food Festival. The festival, which takes place at the Bangalow Showgrounds on the first Saturday of September, showcases the best food and drink producers from the northern New South Wales area. The Sample Food Festival, started in 2011, gets more than 15,000 visitors just in that one day, and gives access to approximately 150 exhibitors. Entry to the Sample Food Festival 2018 is $5 per adult and free for kids. The festival is supported and was founded by Sample magazine, a quarterly publication that features northern New South Wales restaurants, food producers and more. This year’s festival is presented by the Gold Coast Airport. The Sample Food Festival doors open at 8 am, with cooking demonstrations beginning at 9:15 am, music starting at noon and kids entertainment starting at 9:30 am. The first featured cooking demo on the Bangalow Sweet Pork Cooking Stage will be Chupacabra Chef Evan White demonstrating how to make his Ceviche & slow cooked Bangalow pork cochinita, handmade corn tortilla and sauces. Over at the Celebrity Cooking Stage, each set of celebrity chefs and their TAFE apprentices will have 30 minutes to prepare something from the Mystery Box, starting at 9:30 am. The afternoon brings a host of cook-offs between local mayors from around the area. Should be a good time! Check out the festival programme which has a map for more detailed information of who’s stationed where. Don’t forget you’ll have to allow plenty of time for checking out the stalls set up throughout the Byron Bay festival, where you can sample $5 or $10 tasting plates from many of the region’s top restaurants. The plates will be judged and the very best are awarded the Sample Golden Fork Awards for 2018. Also, if you’re bringing along the whole family, don’t worry, there’s plenty for kids to do at the Sample Food Festival, including Macadamia Castle animal shows at 9:30 and 11 am. In addition, there’s a “Bop with Bonzo” at noon. This Bangalow food festival ends at 4 pm. After all that food indulging, you might not want to head home right away. What about taking a nice long walk on the beach? Or heading to the Byron Bay town centre and touring around there? Maybe you’ll walk off some of the calories you consumed! If you truly want to indulge in food and wine in Byron Bay, check out Sample Festival’s other events related to the festival. SOLD OUT: Unfortunately, the popular Fabulous Ladies Wine Soirees, which hosts wine events for women in Australia, is hosting the “Fab Ladies Wine Soirée,” a five-course dinner accompanied by eight matching wines from Irvine Wines on Thursday 30 August. Eat Your Words, a food and fine wine writing workshop, sponsored by Le Cordon Bleu, will be at 10 am on Friday 31 August at the Byron at Byron Resort & Spa. Food and travel journalist Justin Bergman will offer aspiring writers instruction “how to develop ideas that food editors will love and craft compelling stories for publication. Students will then attend Sample Festival and submit stories to be published online, receiving invaluable feedback from a seasoned editor.” Tickets are booked through the Sample Festival site and cost $325–there are only 8 left! Sample Festival Lunch, noon on Friday 31 August: Shannon Bennett and the Vue de Monde crew will utilise fresh, local ingredients into a mix of classic French and contemporary menu, served with matching wines and Stone & Wood brews. Tickets are $150 per person. While the festival is a great reason to come, why don’t you make a weekend (or a long one!) of it and stay over so you can take in more of Byron Bay while you’re here? 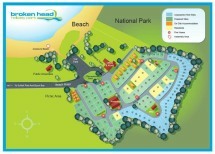 Broken Head Holiday Park is located just a few kilometres from the Bangalow Showgrounds and would be the perfect place for a budget-friendly holiday stay. Broken Head offers various types of accommodation for all types of food lovers who will be eating their hearts out at the festival. From camping and caravanning sites, to deluxe beach cabins, there is sure to be something that meets your overnight requirements, contact us today!